Would your pupils benefit from a bursary from the Joan Dickson Chamber Music Fund? Would you like to provide local chamber music opportunities for your pupils? To award bursaries to ESTA (UK) members to help in the setting up of Chamber Music Projects for their pupils. What has the Joan Dickson Chamber Music Fund achieved? The first JDCMF bursaries were awarded in 1999 since when a total of 150 pupil and 20 project bursaries, amounting to £45,000, have been awarded. The Joan Dickson Chamber Music Fund is generously supported by Hidersine, Jargar, PartPlay, Thomastik-Infeld and Universal Edition. Several JDCMF bursarees have gone on to study at Conservatoires or to read music at University and have credited their acceptance partly to skills honed during the chamber music courses that JDCMF bursaries helped them to attend. 2017 was a bumper year with three students starting at Conservatoires and one gaining a Choral Scholarship to University. One student for each of the years 2014, 2015, 2016 gained places at Conservatoires. JDCMF bursaries are available to pupils of full members of ESTA (UK) to attend Chamber Music courses which they might not otherwise be able to attend. Pupils must be aged 17 or under. The Joan Dickson Chamber Music Fund would like to thank their corporate sponsors for their continued support, and also private individuals and trusts for their kind donations to the Fund. What inspired the Joan Dickson Chamber Music Fund? The Joan Dickson Chamber Music Fund was established in 1997 to honour the memory of Joan Dickson, a founder member of ESTA (UK) and Vice-Chair to Sir Yehudi Menuhin. For Joan Dickson, chamber music is the essence of all that is greatest in music and she saw it as infinitely beneficial in the development of young players. The Joan Dickson Fund, established in her memory, is designed to foster the playing of chamber music among the young. Any practical needs can be catered for, such as the setting up of small libraries of music, the hiring of rooms for rehearsing, organising visiting chamber music coaches and helping ensembles to attend courses. Joan Dickson was born into a very musical Edinburgh family, and throughout her childhood friends and family members gathered regularly to enjoy playing together, fostering her lifelong love of chamber music. 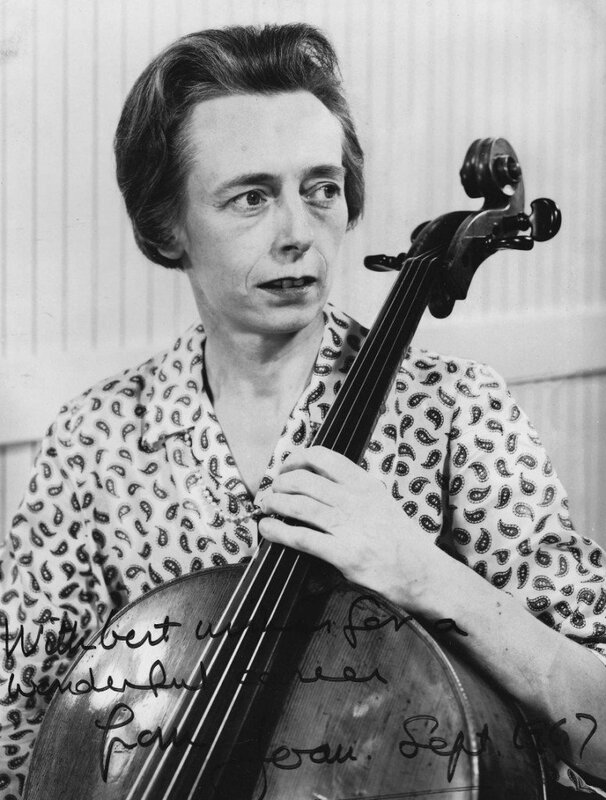 She became internationally known as a cellist, an inspired teacher and a chamber musician of distinction: she was a founder member of the Edinburgh Quartet and later joined the Scottish Trio. Her pioneering involvement with ESTA stemmed from a deep concern for fostering the highest possible standards in string teaching at all levels. At ESTA courses and similar events she preferred to call her classes “workshops” rather than “master classes”, reflecting her unpretentious attitude to her role as teacher and facilitator. Her influence was widespread and embraced conservatoire, private practice and peripatetic class teaching both at home and abroad. The sound musical logic of her interpretations was conveyed through her wonderful use of the bow as well as her mastery of the fingerboard. Having been persuaded that cellists at large would like to use her material in their practice, she collected a series of her exercises together in a book ‘Freedom of the Fingerboard’. Originally published by ESTA (UK) and now by Spartan Press the book continues to support ESTA financially and is always in demand. Joan taught for many years at both the Royal College of Music and the Royal Scottish Academy of Music & Drama (now the Royal Conservatoire of Scotland) and her presence and dedication to teaching greatly enhanced their status. At the RCM her students received a balance of one-to-one and group lessons, as she believed they could learn so much from each other’s lessons. She was endlessly supportive of her pupils and colleagues and was passionate about introducing young players to the world of ensemble playing at whatever level and wherever situated. She always had a number of younger pupils under her care as she believed that the most vital lessons are those taught in the first year. In 1965 she was awarded the Worshipful Company of Musicians’ Medal for Services to Chamber Music. She undertook any activity with great energy and commitment, expressing the competitive side of her character on the golf course, in croquet and table tennis, and becoming an enthusiastic computer user when they were still in an early stage of development. Joan combined a serious, honest, no-nonsense approach to life with a youthful energy and a surprisingly girlish sense of fun, all of which made her a natural choice for the teaching faculty of ESTA summer schools and conferences. It is a mark of the respect in which she was held by the chamber music world that the first of the series of fund raising concerts which raised the initial £26,000 from which JDCMF bursaries are awarded was given by the Endellion Quartet.